Companies of all sizes and within many industries still use the office cubicle as their main office furniture for supporting the workflow of their daily operations. Over the years, the concept of the office environment has changed with the goal of accommodating happy and productive workers, including a trend toward virtual and open-plan offices which were meant not just to free the employee from the so-called drab, confining space of the office cubicle but also to free the company from unnecessary costs associated with furnishings and paneling. With a traditional office environment, however, you really don’t have to be burdened by either; you can still enjoy a productive office environment within a reasonable budget by selecting the right office cubicles. Are you a small family business looking for something low-cost but quality? Are you a startup, where your funds may be limited for now? Are you in the process of rehiring people after a recent layoff? Or perhaps you’re operating in a small town or rural area. Our office cubicles offer almost endless customization to meet the needs of your specific company at a reasonable cost. If you’re looking for an environment that values collaboration while giving employees the privacy needed to focus on individual tasks, then there’s an office cubicle for you out there that can do the job, all while looking attractive and staying within your budget. 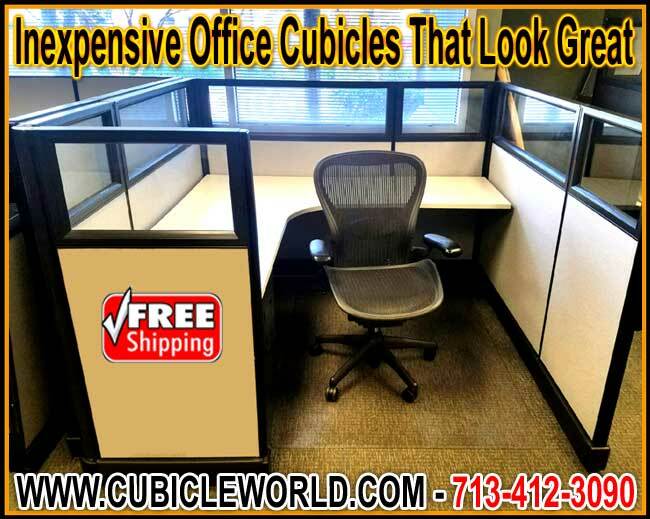 Because price does fluctuate with your choice of material, size, and features, talk to a professional at Cubicle World for guidance on a great-looking cubicle that fits your budget. The material of your office cubicle makes not just a visual impact but a cost impact too. Cubicles can be made out of many different materials that range greatly in price as well, but don’t make the mistake of thinking that a low-cost material means a low-quality one. For instance, most people love the look of natural wood in their office space, though real wood can be too costly to justify its use when a business wants to keep costs low. Looking at alternatives like wood veneer and high-pressure laminates offers a large range of solutions that mimic the natural look of wood for much less cost. Other colors and finishes are available to coordinate your office cubicles with virtually any interior design choice. Their sturdiness and excellent scratch and dent resistance contribute to a long, low-maintenance life as well. Fabric is also an option, particularly where noise reduction is a concern around your office space. As a highly sound-absorbent material it can help to dampen environmental noise in order to keep employees focused on their individual tasks at hand. Like veneers and high-pressure laminates, fabric can come in many different colors and textures that suit your tastes. Whatever material you decide to use, panel height is a good way to add appeal to your office cubicles while keeping costs low. Luckily, if you don’t care to confine employees in a “Dilbert”-style box, you can kill two birds with one stone by overlooking high cubicle walls—they generally start at over five feet high! At the other end of the cost spectrum are lower walls, which are often 42” in height. These are a smart choice in collaborative settings but offer little in the way of visual and acoustic privacy. A happy medium can be found in 53” medium-height office cubicle walls, or even a combination of all of the above. Glass panels can add spaciousness to your office cubicle. They can allow for crucial ambient lighting and add a sense of connection to one’s surroundings while still maintaining a physical boundary for a reasonable amount of personal privacy. Keep in mind that glass can be an expensive feature for an office cubicle, but if used strategically, it can give lead to more comfort for your employees without going over your budget. Another consideration is the variety of features an office cubicle can have. Trays for binders and loose paper documents, drawers for storage and files, overhead storage bins, tack boards and bulletins boards for notes and so on—all these features can be attractive and useful touches to your cubicle. But what good is spending the extra cost on a paper tray or file drawer if your office is paperless? If your workflow doesn’t necessitate them, these awesome features can easily become a nuisance, leading to extra clutter in an otherwise comfortable workspace. At Cubicle World, we work closely with you to decide on which office cubicles meet your business and office needs while being attractive and affordable too. We provide free estimates with no obligation to buy. We also strive towards short lead times when delivering your office cubicles, as well as offer continued maintenance and repair programs. To discuss these points and more, don’t hesitate to call Cubicle World now!